This locals bar is where you’ll want to park your Harley! 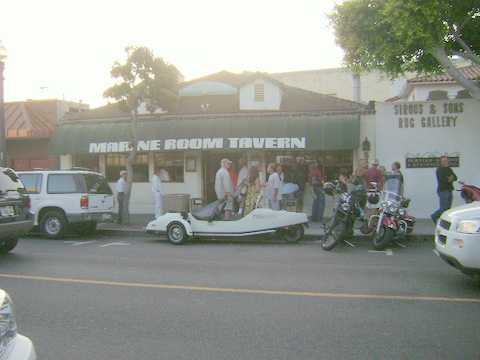 Marine Room Laguna Beach is the locals bar where you’ll find all the Harley’s parked out front. If you’re walking anywhere nearby on most nights- you’ll hear the sounds of some great live bands pounding out into the street long before you arrive at the Marine Room. And when you head into this bar, you’ll find it packed with locals enjoying the live performances of a variety of great bands. The green awning is an unmistakable beacon for locals looking to have a great time. As you get closer- you’ll be able to admire the showing of Harley’s parked along the street right in front of the main entrance. Don’t expect to find any exquisite cuisine here. The Marine Room Laguna Beach is a bar. It doesn’t try to pretend to be anything else- and it does its job well! Plan on this- its going to be crowded, its going to be loud, and if you want to have fun and meet some great people… that’s going to happen too! If you’re 21 years old- your probably gonna be the youngest ones in the room. The local crowd that frequents this bar is a little older, but don’t let that scare you away. If you’re ready to step out of your comfort-zone a little, you’ll have a great time! If you’re around on Tuesdays- check out the Songwriters Showcase, where amazing undiscovered local talent play a wide-variety of surprisingly good music. On Sundays- don’t miss the Missles of October. I’d try to describe their rock-blues-folk style, but you just have to hear it yourself. Just go- they’re awesome! If you enjoy "motorcycles" you might also be interested in checking out the motorcycle clothing and fashion designs at EuroPapi. Share Your Marine Room Experience! Do you have a great story, experience, or photos from the Marine Room? Share your review and/or pictures from this Laguna Beach bar and nightspot here! Marine Room is easy to find, it’s practically right across the street from Main Beach on Ocean Ave. Look for the "news stand", the Harley's, and listen for the music pouring out into the street... and you'll find it!